Let’s get this out of the way. The make-up for Dustin Hoffman as a 120 year old man in 1970’s Little Big Man is pretty awful. But they don’t have to make up the location setting of the Custer’s Last Stand Battlefield, because the filmmakers used the actual setting in Montana. The film is based on the novel by Thomas Berger, a fanciful retelling of history through the perspective of a man who lived both as an Indian and a white man in the Old West. A boy, Jack Crabb, is rescued from a Pawnee massacre by the Cheyenne, who raise him as their own and rename him Little Big Man. Crabb rejoins white culture and lives as a medicine salesman, a gunfighter, an army follower, and a drunk. But most important for this blog, he lived for a time with a minister and his wife. Jack says, “I didn’t know anything about a thing called sin,” but he learns. He eventually gives in to temptation of young women in town, and when the Reverend catches Jack rolling with a young woman in the hay, the Reverend beats him. But Jack’s “religious period” ends when he goes to town with Mrs. Pendrake and catches her making love with the man who runs the dry good store. (Years later, Jack comes across Mrs. Pendrake using a different name in a whore house.) Toward the end of his life, Jack tells the interviewer that he hasn’t sung a hymn in 104 years. 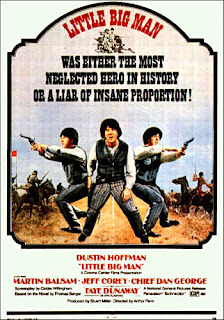 And may I repeat that Little Big Man was not only set in Montana, but was filmed there (and in California and Canada). 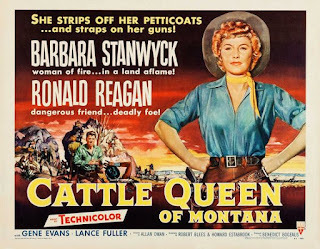 There have been other Westerns set in Montana (such Open Range, perhaps the best Western of the 21st century), but most weren’t actually filmed in Montana. 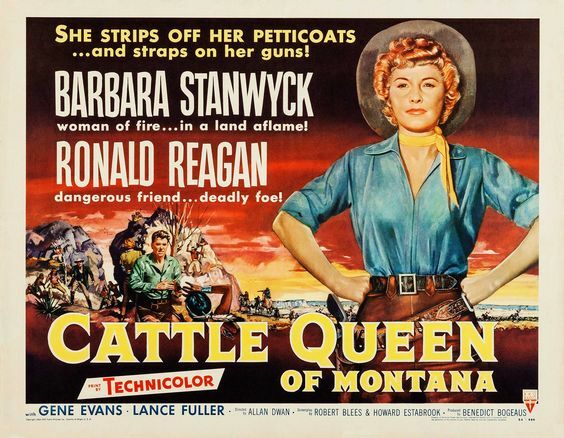 But 1954’s Cattle Queen of Montana did film in Montana’s Glacier National Park. Barbara Stanwyck stars as a woman with the awesome name of Sierra Nevada Jones (but none of the film was shot in Nevada). As great a star as Stanwyck was, she is not the biggest name in the film. The film also stars a future President of the United States, Ronald Reagan. 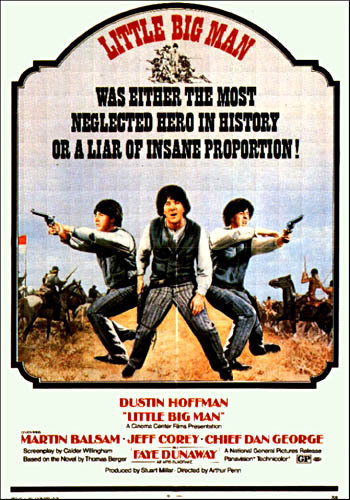 A cattle rustling film set in modern times was 1975’s Rancho Deluxe, starring Jeff Bridges in his twenties. Much of the film was shot in another National Park located partly in Montana, Yellowstone. The rest of the film was shot in the small town of Livingston, Montana, where we stayed a night. Another contemporary Western/heist film was 1974’s Thunderbolt and Lightfoot, starring Clint Eastwood and directed by Michael Cimino, which was also filmed totally in Montana (Lewis and Clark National Park, Great Falls, Choteau, Augusta, Fort Benson, and Hobson). Robert Redford directed and starred in a modern Oater, The Horse Whisperer, about a man with a special affinity with horses. It was filmed in Livingston and other Montana locations, as well as New York and California. I love most of the films of Steven Spielberg, but there is one film I’ve tried to watch a couple of times and quit both times part way through because of boredom, 1989’s Always. Richard Dreyfuss (Jaws) plays a daredevil pilot who takes one risk too many and must spend much of the film dead. As most of the film is dead. But it did film in Bull Lake and Libby, Montana (and also in Utah and Idaho). One of my favorite books, one I’ve used quite often as a sermon illustration, is Young Men and Fire, written by Norman Maclean. It is the true story of fire jumpers in Montana. Maclean also wrote a novella, A River Runs Through It, to great acclaim. 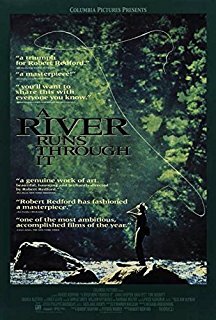 Robert Redford directed the adaptation of that novel in 1992. The film was one of Brad Pitt’s first starring roles as the rebellious son of a stern minister (Tom Skerritt). I should write up the movie church in that film more fully sometime, but this is enough for today.